In 2013, only 21 per cent of Roma refugee claims in Ontario were positive. Over the next few years, the total number of claims processed started to rise. It's a trend sparked by the removal of corrupt lawyers and a change in government rhetoric, one immigration expert says. For Roma refugee Virginia Ivancsik and her family, getting the opportunity to start a new life in Toronto was a seven year process marked by refused refugee claims, deportations, and multiple trips back and forth to their home country of Hungary. Finally, just last month, the 27-year-old got some good news: Both she and her partner can officially stay in Canada. The Roma couple is now one of a rising number of Ontario refugee success stories among the Roma community — a trend revealed by data involving nearly five years of Immigration and Refugee Board decisions obtained through a CBC News investigation. In 2013, only 21 per cent of Roma refugee claims in Ontario were positive. Over the next few years, the total number of claims processed started to rise, and so did the number of positive outcomes, from 55 per cent in 2014 to 77 per cent in 2015. Since then, the number of positive cases has stayed above 70 per cent, meaning the board is giving more Roma claimants the green light to stay in Canada. "What that tells us is when you get rid of the political campaign against Roma refugees, Canada's administrative processes find that most Roma refugees, in fact, do have a well-founded fear of persecution," said Sean Rehaag, an associate professor at Osgoode Hall Law School at York University. Rehaag said a shift in government rhetoric in recent years happened around the same time that multiple corrupt lawyers — who weren't properly assisting their Roma clients — were exposed publicly. He believes those are the two key factors behind the rising number of successful claims across the province. Alongside a team of researchers, Rehaag previously examined more than 11,000 Hungarian Roma refugee claimants between 2008 and 2012, and found under nine per cent of those claims were successful. At the time, Rehaag said the Canadian government was portraying Roma as thieves and "bogus" refugee claimants who wanted to take advantage of the welfare system. ​The reality is different, he said, adding he believes persecution of Roma in Hungary has been on the rise in recent years. From forced evictions to workplace discrimination, Rehaag said widespread racism and fears of violence make daily life difficult for Roma across the European country, although the Hungarian government claims conditions have actually been improving. "There have been instances of skinheads going into Roma communities and burning down houses and attacking people," he added. But those concerns weren't always being conveyed properly to the Immigration and Refugee Board by multiple Ontario lawyers, Rehaag said. As CBC previously reported in 2016, three lawyers who handled thousands of claims from Roma families between 2008 and 2012 were collecting huge amounts of money in legal aid fees, but only a tiny number of their clients were ever accepted. Those lawyers have since been disciplined or disbarred for improper conduct such as failing to translate important documents, not presenting accurate details of the persecution clients faced in their home countries, and not showing up at clients' hearings. Ivancsik said she and her relatives previously used one of those now-infamous lawyers. It was just one of many challenges the Roma family faced in their years-long battle to stay in Canada. After growing up in a country with a segregated school system, where passersby would call her names like "stinky gypsy," Ivancsik fled Hungary in 2011 with her parents and a brother and claimed refugee status in Canada. That's where she met her partner, Krisztian. The pair fell in love, and when Krisztian's refugee claim was refused — meaning he would be deported — Ivancsik withdrew her own claim and returned with him to Hungary in 2013. That same year, Ivancsik​'s parents and brother were removed after losing their claim, which had been handled by one of several Ontario lawyers since suspended for malpractice. Back in Hungary, the whole family soon realized their home country was growing increasingly unsafe. Finding stable work was impossible due to widespread racism in the workforce, Ivancsik said. The couple and their relatives also endured violent, targeted attacks. In 2014, extremists attacked Ivancsik's father and brother; two years later, a group of Hungarians attacked Krisztian and his friends at a bar. Ivancsik said she also experienced racism while pregnant with her 18-month-old son, Benjamin. She said Hungarian doctors wouldn't touch her without gloves on, and didn't treat her properly — ignoring a number of symptoms she brought forward during pre-natal treatment. 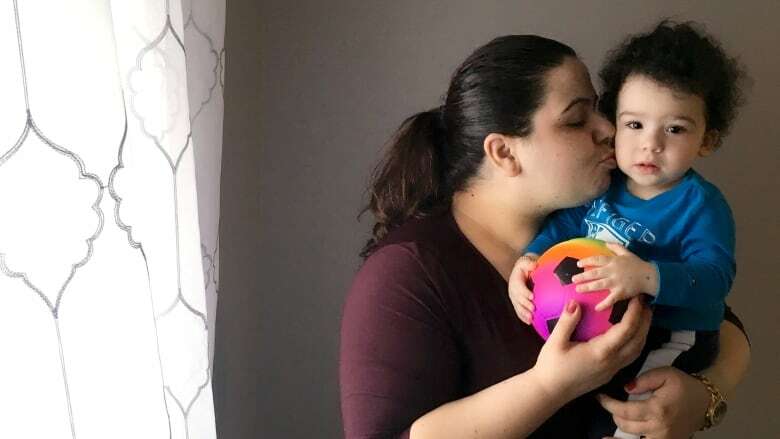 While visiting a cousin in the U.K., Ivancsik learned from a British physician that she had preeclampsia, a potentially-deadly pregnancy complication characterized by high blood pressure, which required her to have an emergency C-section. It was the final straw for Ivancsik. "I can't even imagine that my baby would grow up in these circumstances," she said. The couple fled Hungary again in November 2016, along with Ivancsik's family. Since then, Benjamin's refugee claim has been accepted, and Ivancsik and her partner recently had their pre-removal risk assessments accepted, meaning they can stay in Canada and eventually apply for permanent residency. But the fate of Ivancsik's mother, father and two brothers remains in limbo. "I'm much better now because I don't have to think that it's possible that I will be returned [to Hungary] … but I'm really afraid about my brothers and my parents," said Ivancsik. "I will be 100 per cent happy when they are accepted also." Ivancsik's current lawyer, Anna Shabotynsky, said the family is an example of the "injustice" that lawyers are still seeing between different Roma refugee claimants, with some still being accepted while others are not, even within the same family. "We don't know what the result will be," said Shabotynsky, an associate at Toronto-based immigration law firm Lewis & Associates. "I can't imagine that it can be justified that one family that has had the same experience would not be accepted." However, the Immigration and Refugee Board of Canada stresses that the situation behind the scenes may be more complicated. "Refugee determination is one of the most complex forms of decision-making," said Melissa Anderson, a spokesperson for the board. Many factors can impact decisions, she said, including everything from a specific region or city where a claimant lived, their gender and age, whether they spent time in a third country before coming to Canada, and the evidence provided — or not provided — by the claimant or their legal team. "Cases that appear to be very similar or identical at first glance may end up being quite different," Anderson added. "For example, two claimants who come from the same region with very similar stories may be issued different decisions because one may be credible and the other may not." It's a scenario Ivancsik knows well, but she hopes the positive trend for Roma refugees in Ontario continues so her family can stay together in Toronto. Already, she said she has experienced a sense of freedom unlike anything she felt in Hungary. "People are nice here. Even when we are walking on the street, they are smiling," she said. "When we were walking on the street in Hungary — sometimes they would spit on us." The data used for this story was obtained from the Immigration and Refugee Board through an Access to Information request. It includes 89,517 claims that were finalized, or concluded, between Jan. 1, 2013 and Sept. 30, 2017. This data refers to refugee claimants, or individuals who have made a claim in Canada for refugee protection. It does not include government or privately sponsored refugees. To see our full analysis and download the raw data, click here.